If you are one of the many having difficulty paying a mortgage, do not read on. Maybe you are unemployed or forced into a job that bores you to tears and are only getting £3.55 an hour for the privilege? Please read no further, this is a health warning. Maybe you enjoy being unemployed in the UK today and live from hand to mouth? Then you shouldn't read on and go find yourself a job instead at the Olympic site. But, I forget, you might be British and East Europeans only need apply. Any and all of you will have heard of the 2012 London Olympics. Stolen from under the noses of our nice French chums, in Paris, who would not give you a euro for the games now. Just what did Lord Coe promise the International Olympic Committee for this, the ultimate poisoned chalice? Who knows and frankly, who cares because all of us in the UK need to start worrying how much this status symbol will cost us. We now have a 100 metre high, elongated whisk to add to the expense. What has this metal monstrosity got to do with the Olympic games? Nothing at all, it's the Boris Johnson (bojo) monument to crap kitsch culture. Where is Prince Charles, monstrous carbuncle and all that? Charlie boy we need your wisdom to flatten the Whisky a bojo once and for all. Our expensive kitchen utensil, with integrated spiral staircase has a platform on top. From the platform, you can see what? 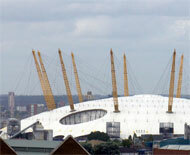 You can see the Millenium Dome. As you line up to dive from the top platform (at £50 a time to cover admin costs)into a recently dredged diving pool, you can admire the view. Then smash you head into the empty pool. Oh, never thought of water says a highly paid friend of Lord Coe, at least they had a good view of London.